Sometimes, a break is best taken on a road stretching into eternity, and these business executives wouldn't want to miss a minute of it! Legend has it that a great monarch, weighed down by a dreadful sickness of the soul, once approached an ageing sage and lamented that there was a chasm of misunderstanding between him and his subjects that - try as he may - couldn't be traversed. "O great sire," he said, "My people don't understand me, and I confess to not knowing much about them either. That, as I have come to believe, makes me a failure as a ruler. Please provide me with a solution to this problem, or take this undeserving crown from my head." The sage fixed him with a wise stare and said that he would find it in a golden flower that grows atop a faraway mountain - provided that it is plucked not by a courier boy or slave, but his very own royal fingers. Now, this solution didn't seem to make the monarch any happier because the road to this mountain was hard and rocky, and he wasn't even allowed to travel in his palanquin. Still, he promised to carry out the task. A month later, the monarch was back - the creases on his forehead more prominent than ever. "I am afraid I have failed in my mission," said the man sadly. "Because at the end of the arduous journey, we climbed the mountain to find no golden flower at the spot. A peasant who was grazing his goats in the vicinity said he had seen an eagle swoop down from the skies a few nights ago, and fly off with the plant in its beak." The sage smiled. "And yet, I hear that you helped many starving villagers on the way to that mountain, and your men even defended a village of cobblers against a gang of villainous bandits. Besides, you stayed at a farmer's home and provided him with the finances to buy much-needed fertilizer. This very morning, I heard some of your subjects discussing how you have become closer to their hearts, and that you even seem to care about them. Is it true that you know more about them now than when you first came to me?" Through these trips, participants get a chance to interact with people far removed from their usual surroundings. The monarch nodded in agreement, wisdom suddenly dawning on him. The sage laughed, "You see, O great ruler, the answer to your problem lay in the journey, not the destination. If there is a teacher that can equal life itself, it's the road - sometimes straight, sometimes winding, yet stretching beyond the horizon and into infinity. Don't ever let the walls of your palace confine you again." Now, this story may be fictional, but the message it contains is as true as it gets. In this age where a tap on the computer mouse can draw information from planets light years away and airplanes can whisk you to the other end of the globe in a matter of hours, one doesn't feel the need to indulge in long, gritty road trips. And therein lies a great human tragedy, because we tend to forget that sometimes, the road to one's destination can be as important as the destination itself. There are many moments from your journey that remain with you for years to come. Sometimes, when our hours get too busy, we tend to forget this. And yet, the message keeps coming back to us - through that stray travel advertisement in the newspaper, an inherent yearning in your heart to drive all the way to the nearest hill station, sometimes even elements of popular culture. Take, for instance, the dysfunctional family in Little Miss Sunshine, the three homecoming marines in The Lucky Ones, the father-son duo in Transamerica or the plethora of Hollywood road trip movies that have people coming closer during the course of a journey. And yet, we do not get out of the house enough, preferring to sink into our living room couch - television remote control in hand. There are, however, a few among us who break away from the couch potato stereotype, even if they happen to be leading figures in the corporate world. Jets and cruise liners are all very good, they feel, but life cannot be complete without a few days of roughing it on the road. 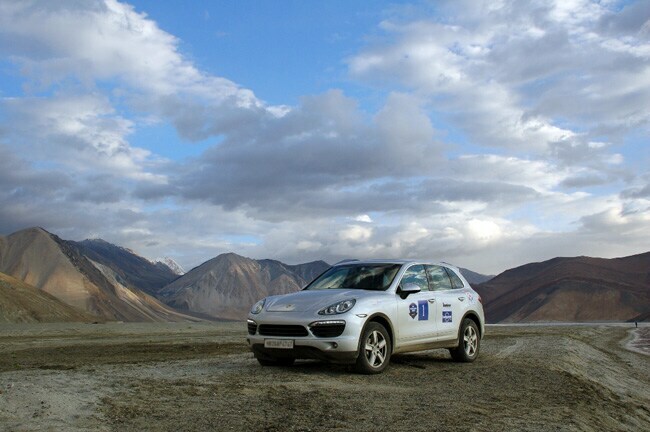 Take, for instance, Bechtel senior executive Gagan Verma, who has undertaken self-driving expeditions with Cougar Motorsport on two occasions over the last four years (in 2010 and 2011). Time on the road, says Verma, broadens one's outlook - bringing him closer to nature as well as the rest of humanity. "During my trip to Ladakh, I travelled through remote parts of the country with hardly any sign of civilisation. Nature has worked wonders in those parts. 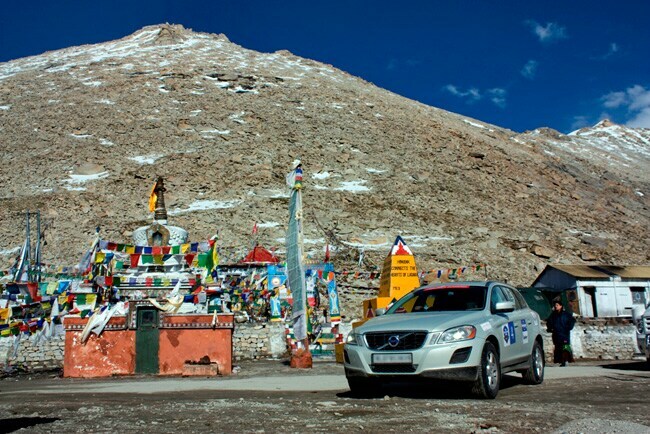 You pass through lush green valleys, barren landscapes, fast-flowing mountain streams and frozen passes, all in one day. You come to realise that you have to live with nature and not try to change it." According to Harish Krisnamachar, senior VP of the World Sport Group, a road trip can also work as a well-deserved break from the humdrum of everyday life. Stating that he had participated in the Cougar-organised Himalayan Dash expedition in 2013, the top executive of the sporting goods agency says, "I believe it is crucial to take these breaks as it helps you recharge and get back to the job that pays the bills. I am a big believer in travel - it allows for constant interaction with the environment around you." 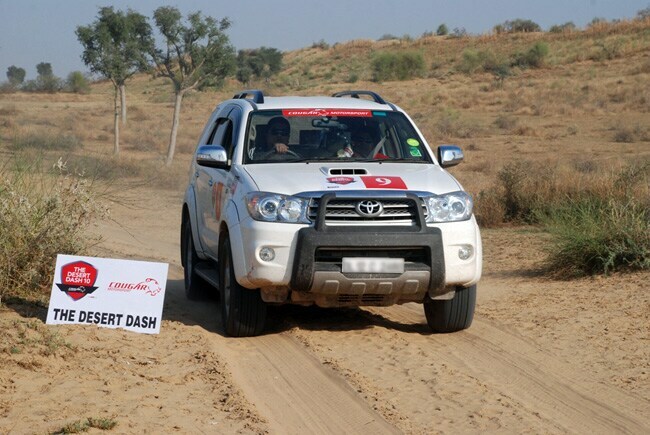 The Desert Dash takes you through the sandy stretches of Rajasthan. And what's more, if undertaken with family and friends, road trips also tighten the bonds weakened by the pitfalls of everyday life. Says Krisnamachar with a laugh, "Anybody who spends two weeks at a stretch within the confines of a car is bound to come closer. No surprises there!" Ask Verma, and he will tell you how travel broadens a man's outlook, acquainting him with people and surroundings far from familiar and giving him a sense of perspective. "During my trip to Ladakh, I could see that the people there lived a tough life - but all they had for us were smiles. And when we reached the top of the mountain pass, I thanked the Almighty for allowing us to pass to the other side. Because it didn't matter how rich we were or what machine we were riding, the smallest rock can stop you from moving ahead on that road." Wildlife driving expeditions, on the other hand, can be a dream come true for those with a fascination for beasts from the wild. "It's a very different experience," says Verma, "While the mountains humble you, the mysterious forests draw you to them. 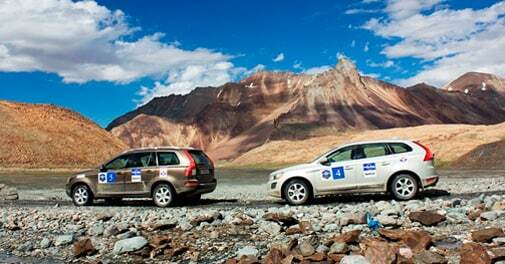 During the 2011 Wildlife Dash, we drove through four national parks - Panna, Bandhavgarh, Kanha and Pench. We got to see a variety of animals and birds, including spotted deer, barking deer, langurs, crocodiles, parakeets, blue jays, robins, kingfishers, owls and tigers." So, what makes a top executive get behind the wheel and start driving? A desire for adventure and a yearning to reconnect with a way of life that has been left behind us. But if you are looking for a face, it would be that of Ashish Gupta - founder and director of Cougar Motorsport Pvt Ltd.
An investor banker by profession, he founded Cougar Motorsport - a club that organises road expeditions for owners of high-end luxury cars and SUVs - giving them a chance to discover a world of adventure without compromising on safety or convenience. So, what first prompted him to come up with such an initiative? Says Gupta: "Whenever I shared my motorsport experiences with peers in the banking and corporate world, they would express a desire to participate in motoring events. They, however, desired a balanced experience with the right mix of adventure, comfort and safety. While there were some popular self-driving expeditions and rallies in the country, such as the Raid de Himalaya and Desert Storm, none of them were based on the concept of luxury. This, coupled with the improving road infrastructure in India and growth in SUV sales convinced me that there was a huge potential for offering such driving experiences in India." Cougar, at present, offers four kinds of road expeditions, namely the Himalayan Dash (taking on the mountains), the Desert Dash (well, the sandy stretches of Rajasthan), the Sanctuary Dash (care for a rollicking ride through India's densest forests?) and the Coastal Dash (driving with the sea by your side). "India has some very beautiful off-road trails that are far more spectacular and awe-inspiring than a lot of popular international tourist destinations. So, the well-travelled Indian, who has been to many exotic locations worldwide, should take out some time to see what his own country has to offer!" But then, charming as our country may be, road trips do not necessarily have to be restricted by boundaries - at least as long as you have the necessary permits in place. Vouching for this is SB Jatti, vice president of the Heritage Motoring Club of India and son of Dr BD Jatti (former Vice President of India). The proud owner of four vintage cars, including a 1964 Ford Mustang and a 1954 Fiat Millicento, he had recently taken up an expedition from Amritsar to Pakistan as part of the India Show in Lahore, organised by FICCI. At the Wagah border, he and his companions were joined by about 50 vintage cars belonging to the Vintage & Classic Car Club of Pakistan. So, there it is, the great uniting factor called road travel. You know what's to be done to strengthen the bonds with friends and neighbours - just jump into your car, turn the ignition and share the road with them. Travel brings the world closer, and you know it!